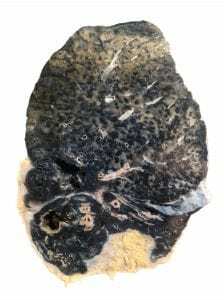 This lung demonstrates the type of damage that continuous inhalation of coal dust causes to the respiratory system, the effects of which are extremely well documented in people within the mining profession. This condition, commonly known as coal miner’s lung, remains a major occupational hazard for people working in mines and agriculture today. This is especially the case in regions of the world where worker’s safety is not regulated or prioritised. The patient from whom this lung was taken received a 100% disability pension for the three years between their retirement and death. In the UK today, mining is an industry in steep decline, with the last deep coal mine closing in 2015. Open cast mines remain in operation but with strict health and safety regulations to protect workers from developing health problems as a result of their occupation. The condition of this specimen reminds us of the importance of worker’s rights and is a testament to the damage caused by coalmining – both to the people working in them, and to the environment at large. Whilst coal production and consumption are declining in the UK, many countries around the world continue to rely on coal for energy. Remembering the dangerous nature of this industry, demonstrated in the untimely death of the patient from whom this lung was taken, is especially important today as influential people, like the current President of the United States, are becoming increasingly vocal about their desires to restore the mining industry to its twentieth-century heyday.